Morlighem, M., E. Rignot, J. Mouginot, H. Seroussi, and E. Larour. 2015. IceBridge BedMachine Greenland, Version 2. Boulder, Colorado USA: NASA DAAC at the National Snow and Ice Data Center. http://dx.doi.org/10.5067/AD7B0HQNSJ29 Last accessed August 2016. Administrative divisions of Greenland, with municipal centers. Public Domain image by Algkalv. Greenland is an island northeast of Canada and The United States. 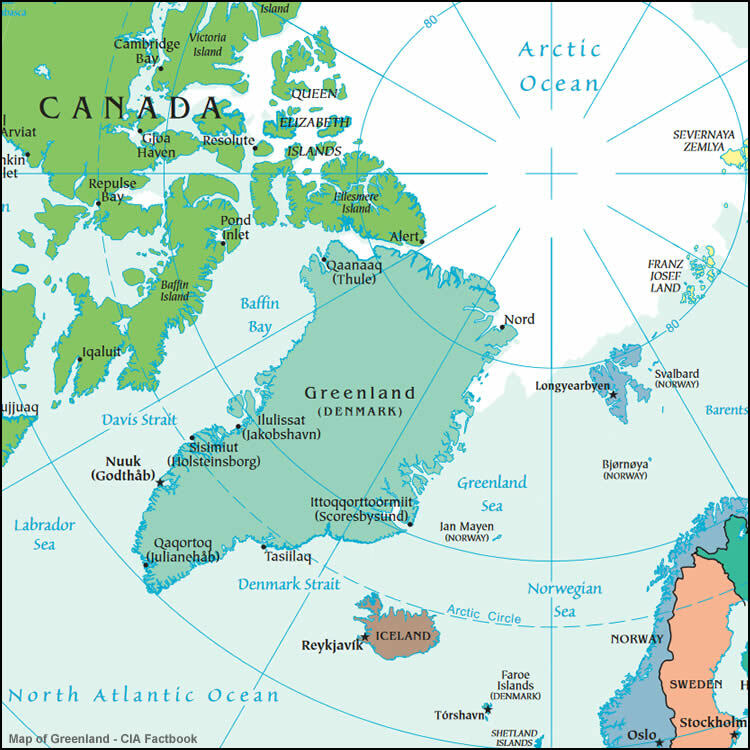 Greenland is bordered by the Arctic Ocean, the Greenland Sea, and the North Atlantic Ocean. 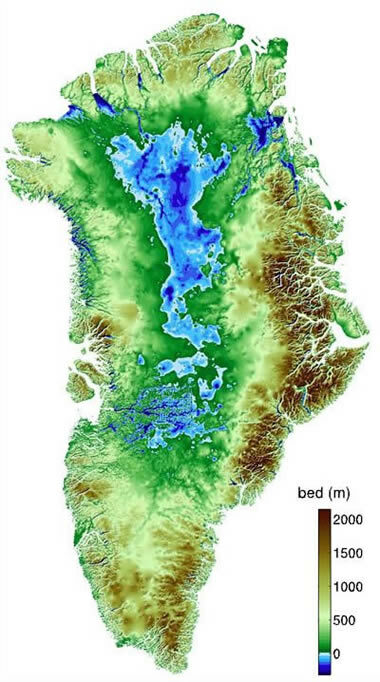 Greenland is the largest island on Earth, and it is physiographically part of the North American continent. However, politically, the island is part of the Danish Realm. Google Earth is a free program from Google that allows you to explore satellite images showing the cities and landscapes of Greenland and the rest of the world in fantastic detail. It works on your desktop computer, tablet, or mobile phone. The images in many areas are detailed enough that you can see houses, vehicles and even people on a city street. Google Earth is free and easy-to-use. Greenland and nearly 200 countries are illustrated on our Blue Ocean Laminated Map of the World. This map shows a combination of political and physical features. It includes country boundaries, major cities, major mountains in shaded relief, ocean depth in blue color gradient, along with many other features. This is a great map for students, schools, offices and anywhere that a nice map of the world is needed for education, display or decor. 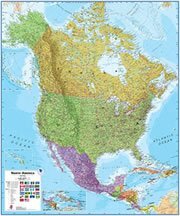 If you are interested in Greenland and the geography of North America, our large laminated map of North America might be just what you need. It is a large political map of North America that also shows many of the continent's physical features in color or shaded relief. Major lakes, rivers, cities, roads, country boundaries, coastlines and surrounding islands are all shown on the map. 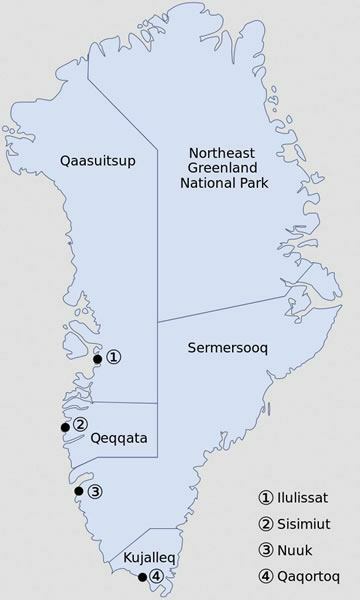 Ilulissat, Sisimiut, Nuuk, Qaqortoq, Tasiilaq, Ittoqqorttoormiit, Nord, Qaanaaq. 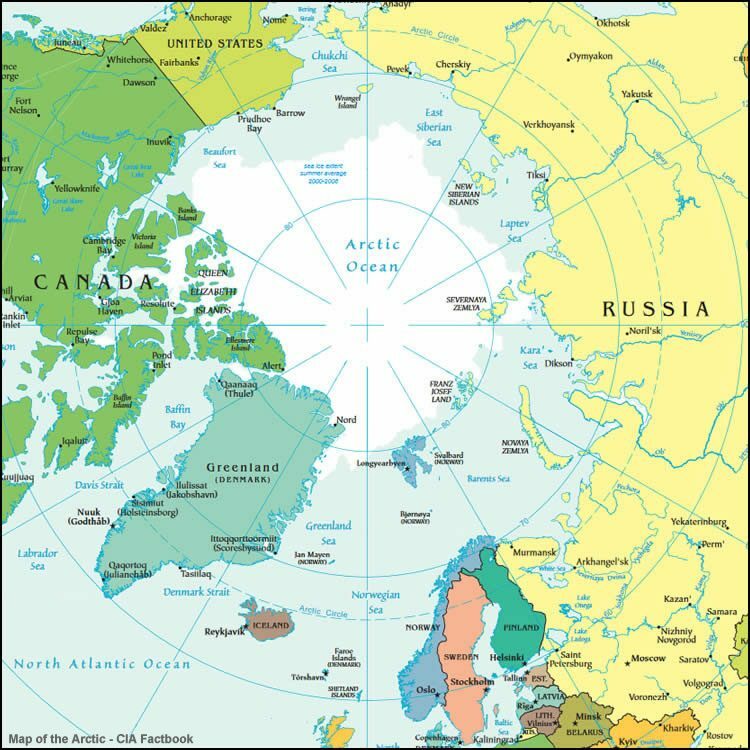 Arctic Ocean, Baffin Bay, Davis Strait, Denmark Strait, Greenland Sea, Labrador Sea, North Atlantic Ocean. Municipalities: Qaasuitsup, Qeqqata, Sermersooq, Kujalleq. Northeast Greenland National Park is not a municipality, but it is the world's largest national park. Highest point: Gunnbjorn Fjeld. Resources known to exist in Greenland: coal, gemstones, gold, iron ore, lead, molybdenum, niobium, platinum, tantalite, uranium, zinc. Also: fish, seals, and whales. The northern portion of the island is covered in permafrost. 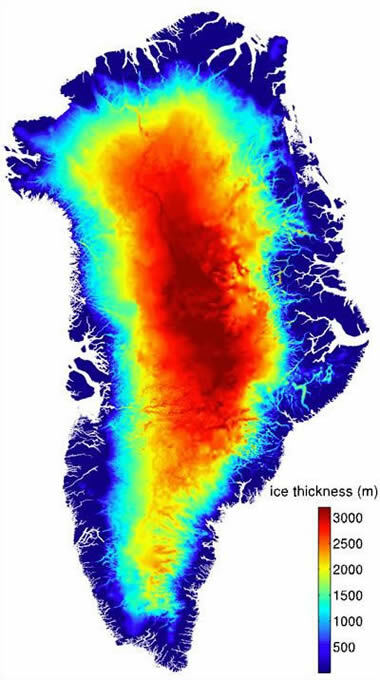 Glacial melting and preservation of the Arctic environment.